Stories rise to climaxes, and our first trip to Paris reached that point on Sunday, when we accidentally stumbled into one of the most profound experiences of my life: seeing the Gothic cathedral in full tilt, with all its bells and whistles sounding. Later trips to France would be focused on the many cathedrals and churches built centuries ago across northern France. A machine is always more beautiful when it is running. A cathedral, as Carole said, is a machine to take you someplace. Today, we saw that machine with all its gears rotating and its cylinders pumping. Not that we expected it when we left in the morning. We were just going to walk along the river, on the Ile St. Louis. 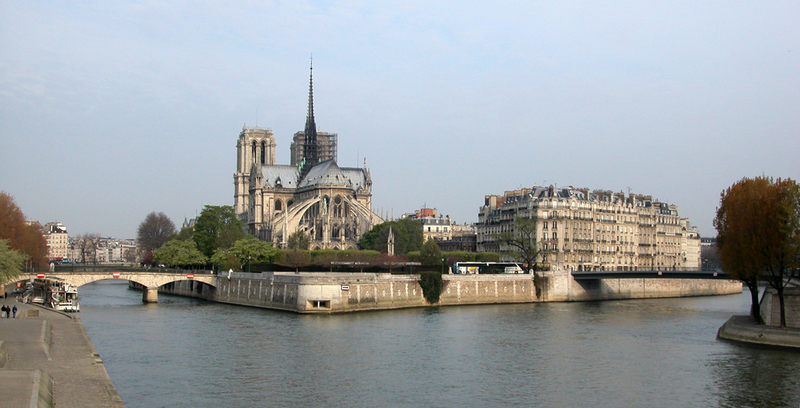 We had a petit dejeuner at L’Etoile d’Or down the street, and wandered over the Pont de la Tournelle and along the Quai d’Orleans, to get a good photo of the cathedral of Notre Dame de Paris on its island. 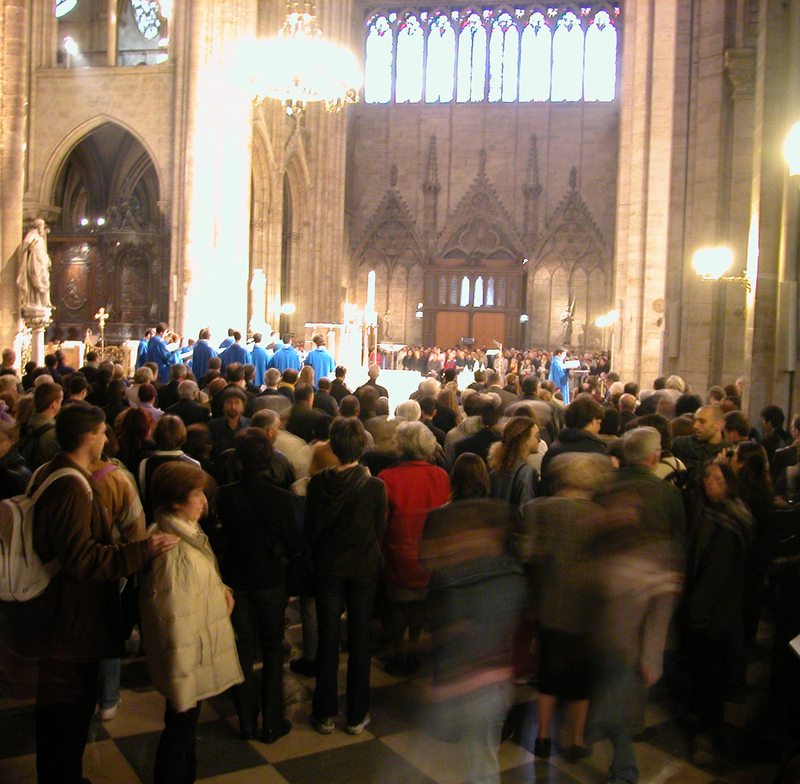 As we crossed over to Ile de la Cite, we noticed hordes of people, tour buses and commotion. “Sunday,” I thought. Must bring out more tourists. They were everywhere. 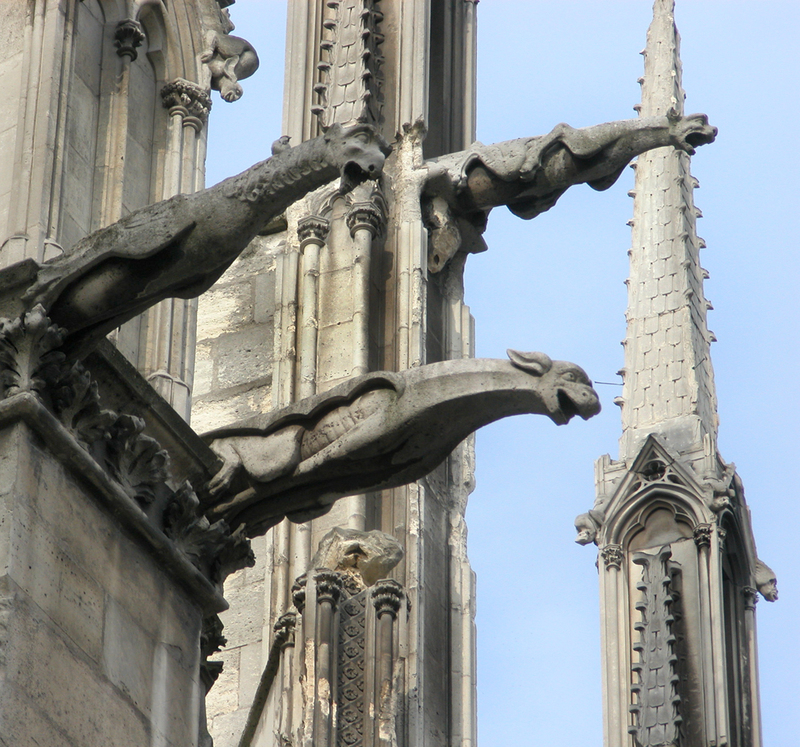 We walked around the north side of the cathedral, to photograph details and gargoyles. But as we passed the transept portal, we noticed that, for the first time, the doors were open. Why not wander in and see. 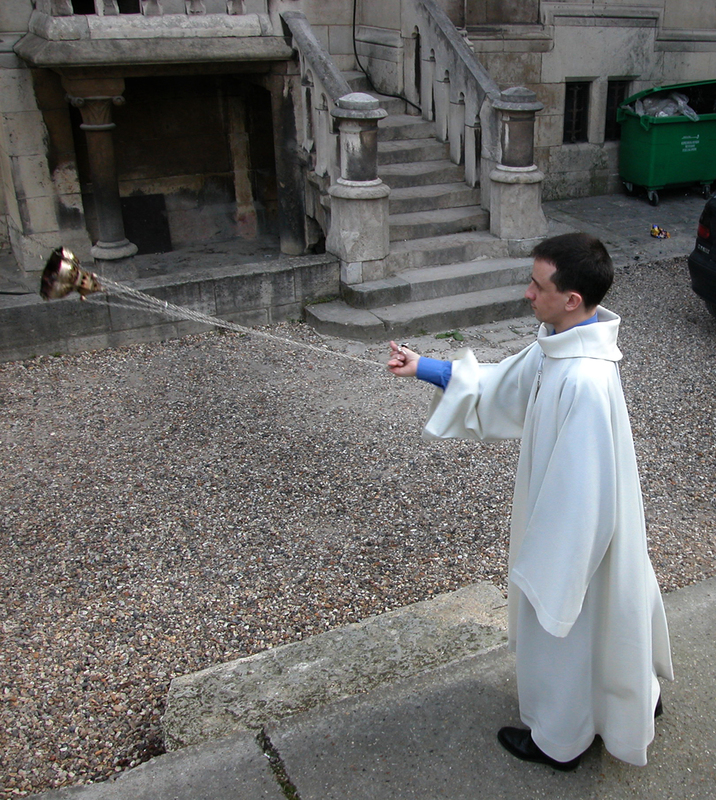 Well, we should have realized, with the bells pealing all morning, that it was Easter. Not our religion, but still, we should have known. Inside, the big Easter mass was being celebrated. The church was packed. Most of the visitors were celebrants, but a good number around the edges were just tourists. The particular music split between soprano and alto was early enough that it did not participate in the tonic-dominant of classical music, but instead flowed endlessly in shifting concord, opening into landini cadences here and there to redirect the tonality. We were privileged to witness the building doing what it was designed to do, like driving a Maserati across the countryside, or seeing the dynamos at Hoover Dam spin out electrical power. I’ve often talked about the “business end” of the cathedral — the choir and apse — in a kind of jocular way, but now I have experienced just what a meaningful business it is. I continued making the photographs I had come to make, getting all the details of the West Facade, the sculptures and portals. While moving from point to point, I left Carole waiting in the crowded plaza so she wouldn’t have to keep up with me while I jumped around. Bach organ music is great for a Lutheran service, but that deep, familiar tonic-dominant drive of the fugues and passacaglias would have seemed all out of place in the middle of Catholic mass. The Messaien is as powerful a music as Bach’s on the organ, but it is built on another schema, one that doesn’t give you an expectation and fulfills it. No, it is much more like the mystery, going into unexpected places and finding awe, finding sublimity. 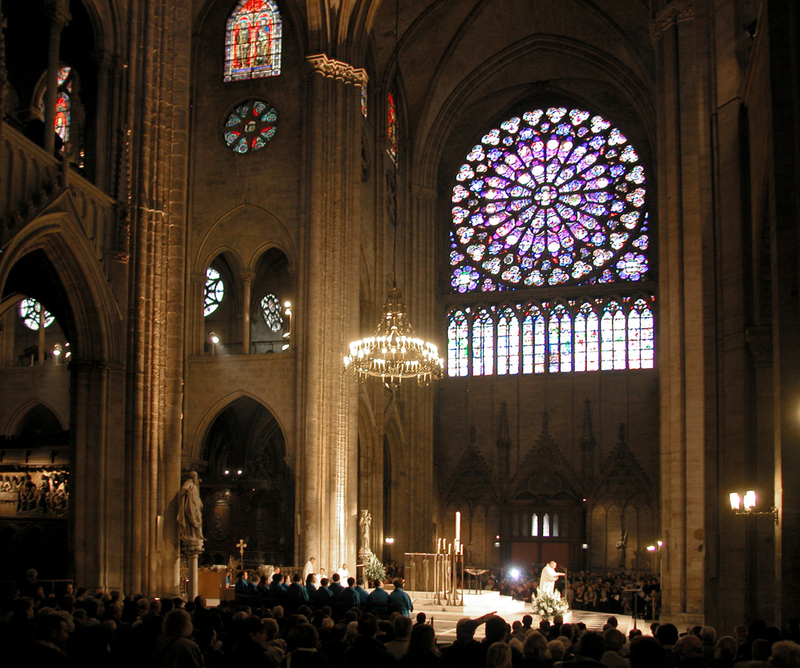 To see the mass, hear the choir and the organ, on an Easter morning, in a 13th Century cathedral, Gothic to the core, with those windows, that color, that light, that theater: It is one of the highlights, not of this trip, but of my life. I was overwhelmed, which is the only appropriate response to the Great Mystery. 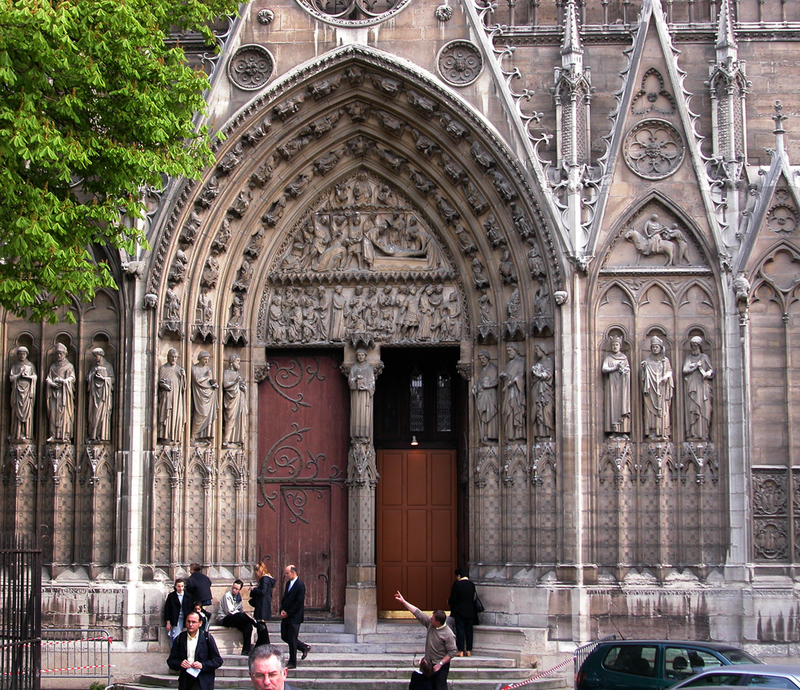 The exterior of Notre Dame de Paris is covered with the tall, attenuated statues of saints. 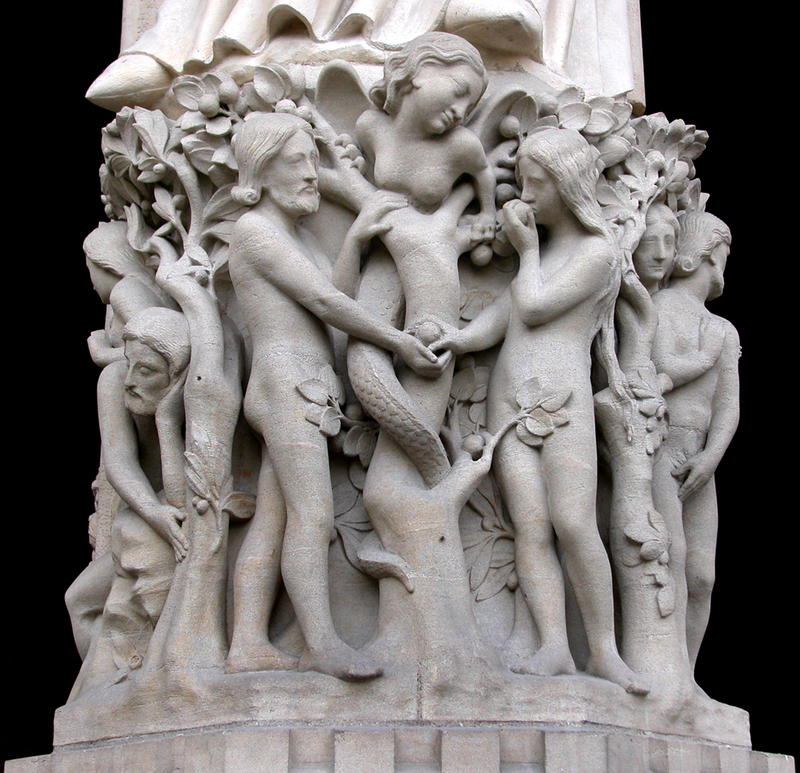 Most of the sculpture there today is the work of Eugène Viollet-le Duc, who restored the worn, weathered and often insulted cathedral in the middle of the 19th century. (After the French Revolution, the deconsecrated structure was used as a barn to store grain.) 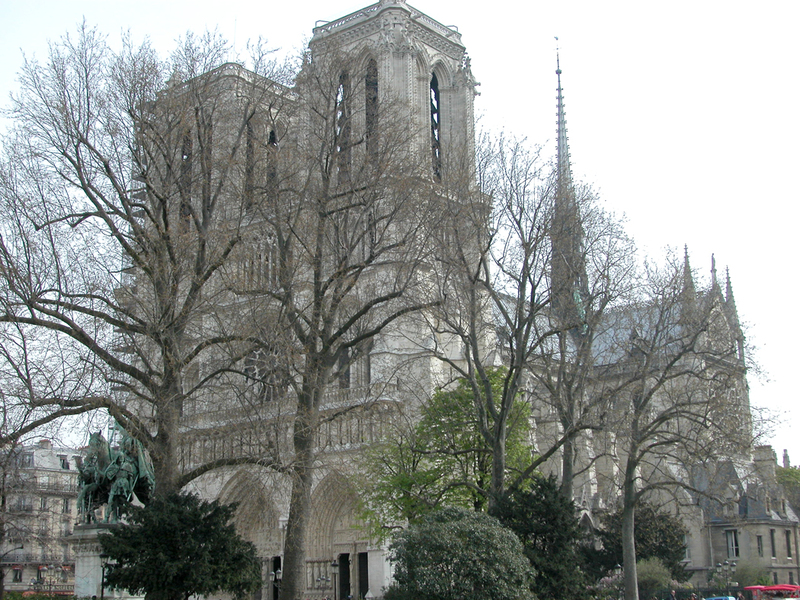 His work on Notre Dame, like his work elsewhere, freshened the architecture and sculpture. No one knows for sure who each of the saints are. Some are obvious from the symbolism, others are obscure. 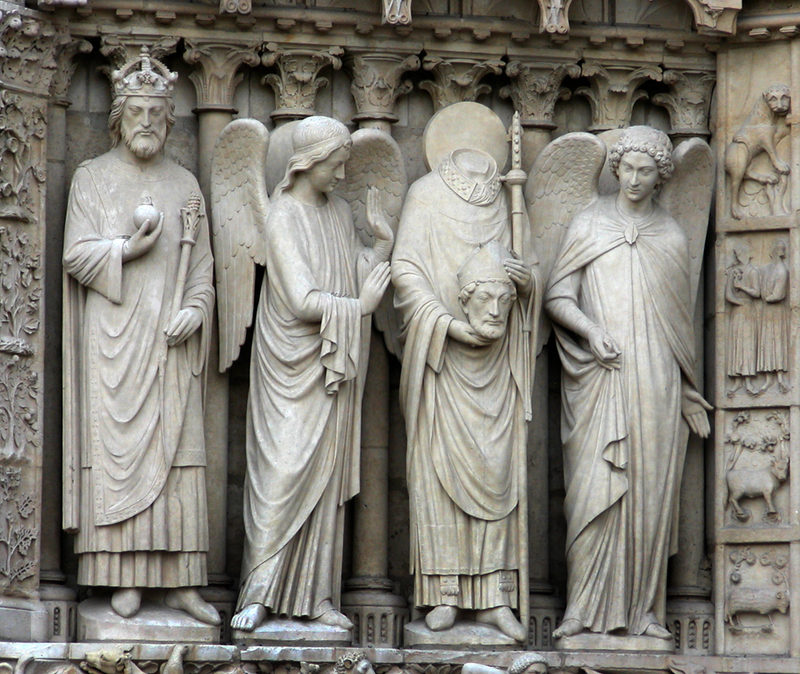 But St. Denis (Dionysius) is clear as can be: The third century saint was beheaded during the persecutions of the Emperor Decius, and he stands at the cathedral in stone, holding his head in his hands. According to Butler’s Lives of the Saints, after he was decapitated, he picked up his head and walked six miles north from Montmartre, where he was executed, to what is now the banlieu of St. Denis, where the basilica bearing his name was later built, and where so many of the kings of France are entombed. 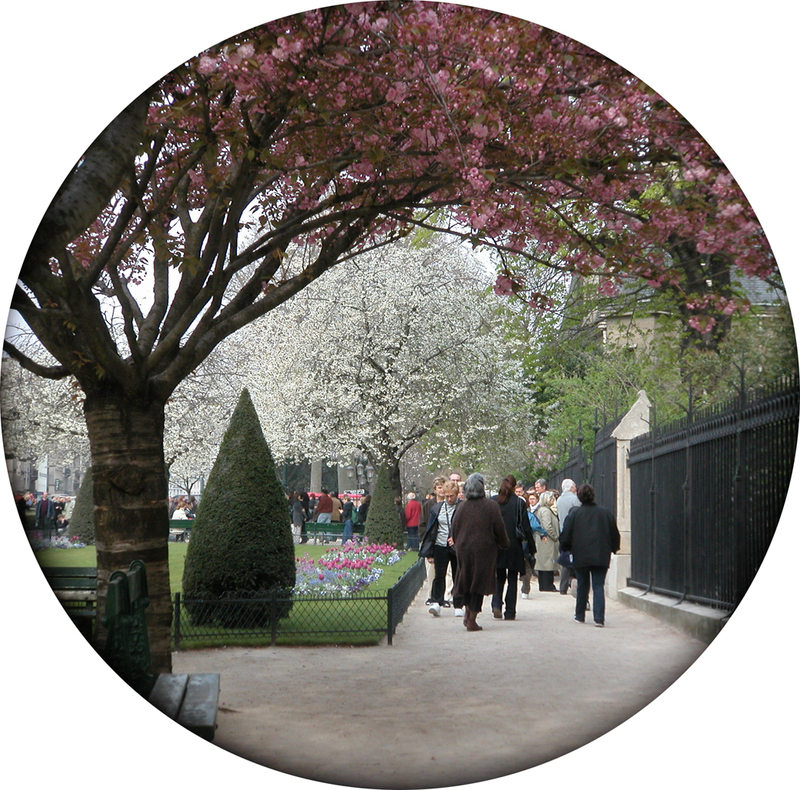 We wandered through the crowds along the river, gazing at the bookstalls, walked up Boulevard St. Michel to the Luxembourg Gardens. 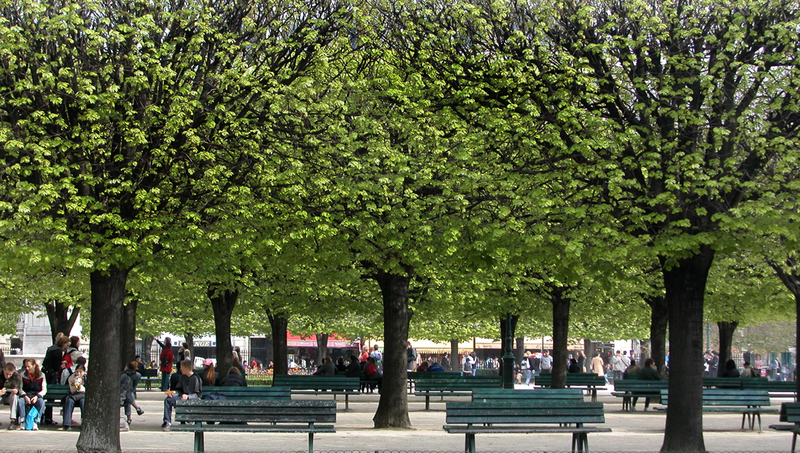 As profound as the cathedral is, the area around it in Paris is a tourist sewer. Even the bookstalls are geared to moving merchandise to a herd of passing tourists. 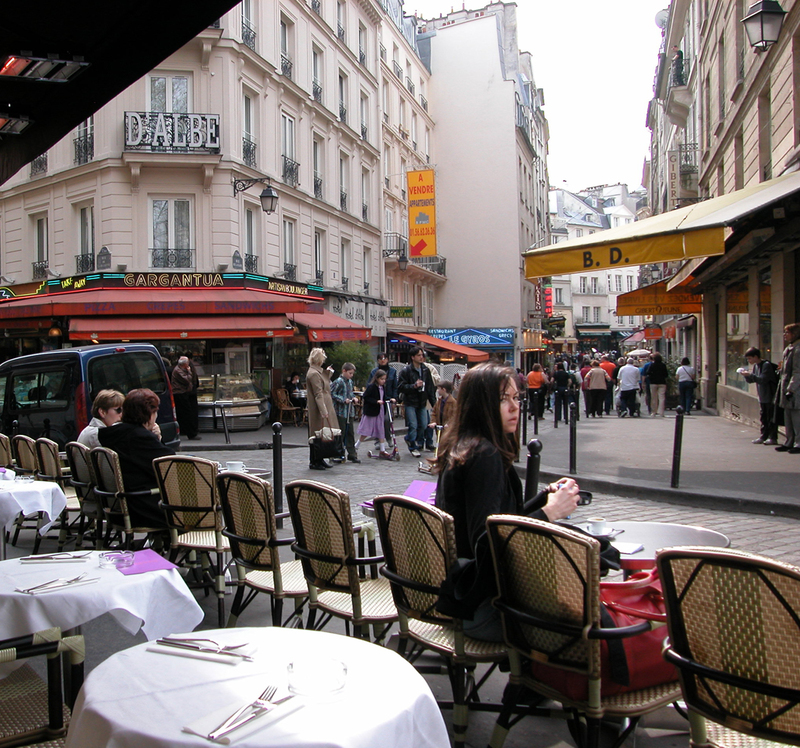 The awful Rue de Huchette is clogged with places to separate you from your lucre, and sell you “naughty” French postcards or mass-produced “original” paintings of the cathedral or the Eiffel Tower. 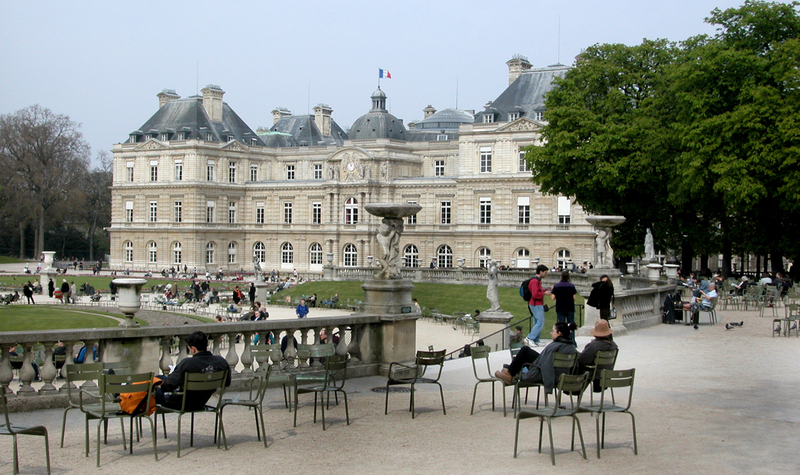 But as we moved up the hill toward the Luxembourg Gardens, Paris reasserted itself and the tourists disappeared. We walked through the gardens, among the statues and horsechestnut trees and were in the middle, once more, of a living city. People all around were walking dogs, sitting under trees and reading, or cuddling or smoking. Teenagers rolled past on their inline skates and joggers puffed around corners. All I heard was French. As we walked back from the gardens, we passed an older section of town (if that isn’t redundant in this ancient city) and had fun spotting all the sculptured apartment facades. There were not only the usual satyr faces and acanthus leaves, but giant elephant heads and lions. 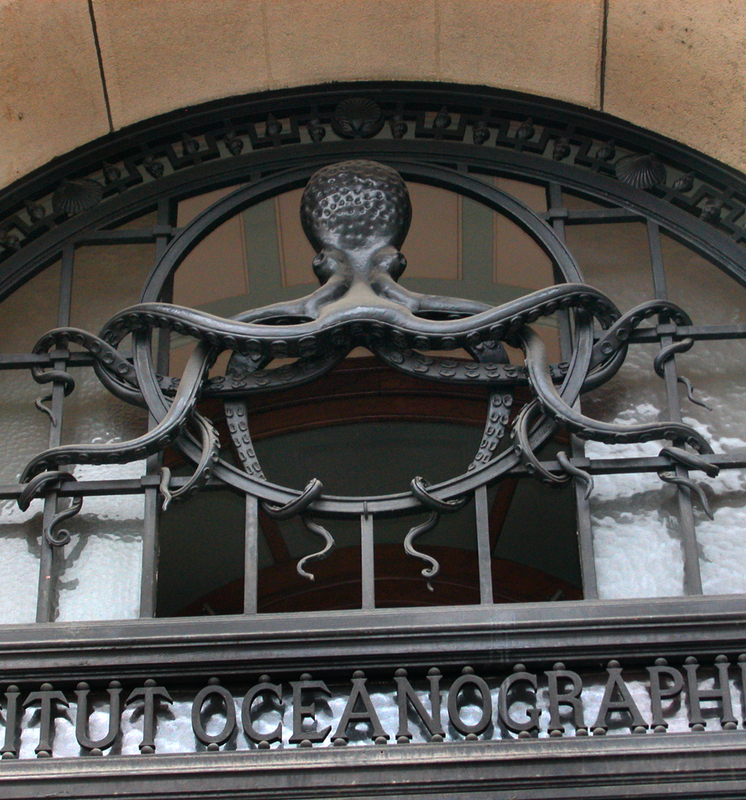 The Institute of Maritime Science had a great wrought iron octopus above its door. When we got back to the hotel, it rained a good clean rain. I had the sensation of being pulled up and up and up. First my eyes and then my body and then my soul. And I don’t know how to say this, but it makes you want to be better. Being inside that building appeals to the best part of you. The incense really worked: It appealed to my sense of smell. I was “smelling in a sacred manner.” And when we left the cathedral I carried some of that incense in my hair for a long time. It smelled a little like cloves, but more like the resin of some wonderful tree. Outside, when we saw some of the members of the choir, they were really young, laughing and being lighthearted, and just a moment before they had been angels. It reminded me of Bergman’s Magic Flute, the way the characters are also regular people and also in the play. I loved seeing the statue of Mary, and she was wearing a crown and holding the infant Jesus, but she didn’t seem sacred to me because she was the mother of God, she looked sacred to me because she was a sweet little mother with her baby.